Now that you are puzzling over what strategy to choose, let us draw your attention to a relatively new, but immensely powerful SMM method – shoutouts in Instagram. Study this notable example of smart SMM strategy of promoting dropshipping on Instagram – this project brought us 195 orders and $2427 in just 1 month (with only 3 monthly orders being normal just a couple of months before). 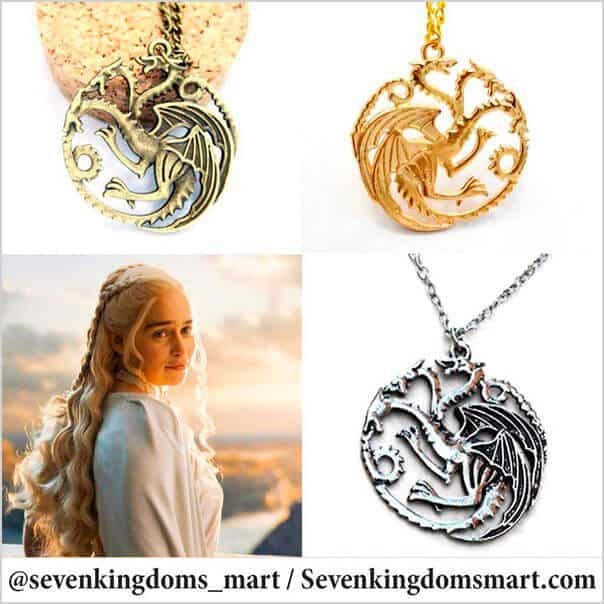 At the moment “Seven Kingdoms Mart”, a merchandise webstore for fans of “Game of Thrones”, keeps on rolling and brings us an ever-growing monthly profit. SevenKingdomsMart.com is a WordPress webstore based on the online wealth dropship fulfilment ssystem. 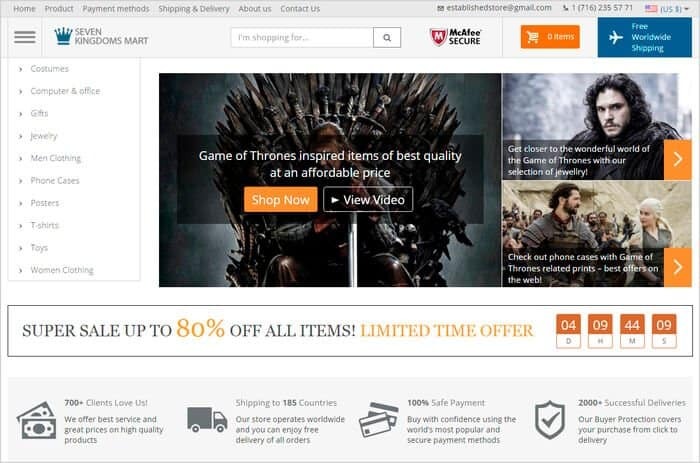 It offers a wide range of Game of Thrones related stuff: costumes, gadget & computer accessories, T-shirts, other clothing, gifts, posters, jewelry, etc. Owing to the huge popularity of the series (the craziest in mankind’s history, as you might already know), we knew at the very beginning that the site would be a bomb. We just needed the site to be seen by the target audience! 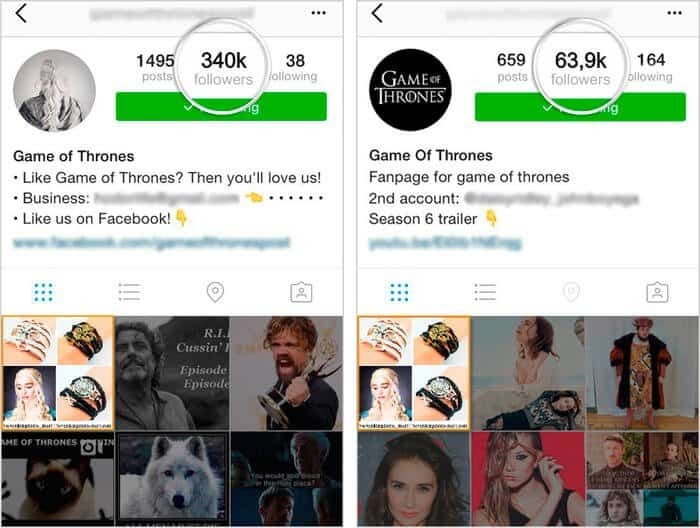 We waited until fan interest reached its peak, just before the beginning of the new 6th season – and we used another huge bomb of recent years – Instagram – to promote the site. And there was an explosion. We used several promotion channels including PPC and on-page SEO, but since the niche is ideal for visual presentation, we focused on Instagram (Facebook, Twitter, Google+ and Pinterest were also involved, but just as an addition). Step 1: Create an Instagram account for your webstore and fill it with product posts and entertaining materials. Don’t forget to add calls-to-action, hashtags and enticing captions. Step 2: Use Instagram search to find other niche related accounts with the highest number of subscribers as possible. Step 3: Contact the owners of these accounts via Direct mail, ask if they publish paid shoutouts and discuss the details. Step 4: Make the payment and provide the materials for shoutout: a product image, a link to the product page, a short caption and hashtags. Wait until your shoutout begins. Step 5: Duplicate the post in your webstore’s Instagram account. Answer comments and questions about the product, and advise where to buy it. Step 6: Watch as your number of account subscribers grows and the curve of social traffic rises in Google Analytics. All this results in good conversions. Not as complicated as you thought, is it? We created the website’s account on Instagram and filled it with primary content before starting the promotion. We made a mix of product (commercial) and entertaining (neutral) posts with neutral ones prevailing. They included memorable movie shots, actors’ photos, citations, series related humor, de-motivators, etc. 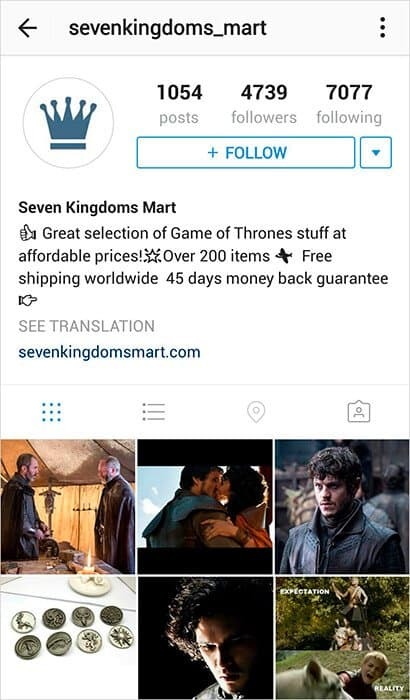 Photo captions contained calls-to-action, links to SevenKingdomsMart.com and popular relevant hashtags to grow the reach. Example: “Like if you find it cool! Love Game of Thrones? Visit us: SevenKingdomsMart.com #gameofthrones #gameofthronesfamily #gameofthronesfan”. Product posts contain a merchandise image, its name and price, a call-to-action (“check out the site”, “ask us for more merch”, “tag a friend”, etc. ), a note about free shipment and a note that there’s an active link in the bio leading to the product page. 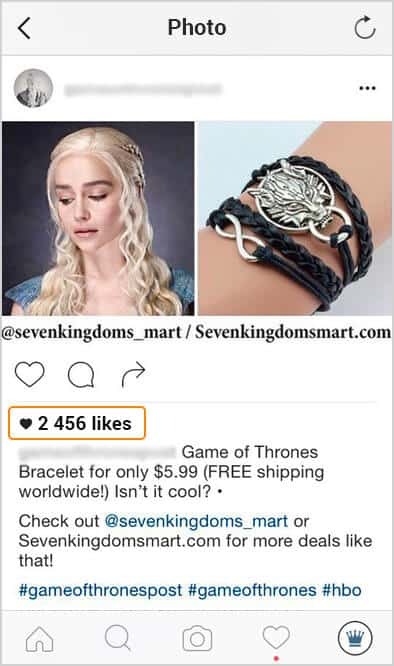 Example: “Game of Thrones Bracelet for only $5.99 (FREE shipping worldwide!) Isn’t it cool? Check out Sevenkingdomsmart.com for more deals like that! Ask us for more merch. Active link in BIO. #gameofthrones #gameofthronesfamily #gameofthroneshbo #gameofthronesfanart #gameofthronesfan #gameofthronesmemes #gameofthronesfans #gameofthronesmarathon #gameofthronestour #gameofthronesaddict”. 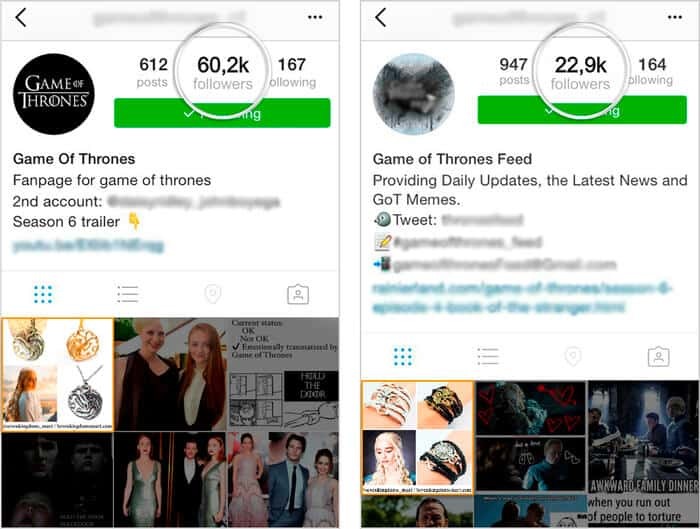 We found numerous Game of Thrones related accounts via an Instagram search and followed the biggest ones with most active subscribers (our target audience). We entered keywords such as “Game of Thrones” or “GOT” into the search field and examined the results. Unfortunately, Instagram does not indicate the number of subscribers to the accounts listed in search results, so we had to visit each one to see this number. Be ready to spend some time doing this. 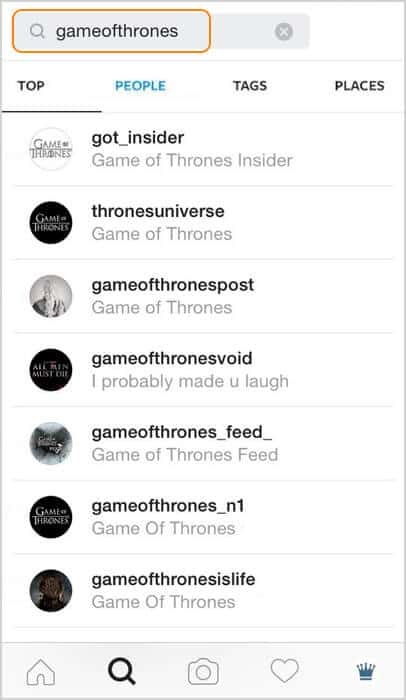 Instagram is choke-full of Game of Thrones addicts, so the list of fan communities is endless. We joined the most popular ones. Having chosen the biggest accounts (10K to 2,000K subscribers), we contacted their admins via Direct mail asking if they published paid posts. In case of a positive reply, we proceeded to the details. The experienced admins normally have ready price-lists and terms of work. The price usually varies from $15 to $50 depending on the size of community. You only agree or disagree to co-operate, depending on your budget and needs. As for less experienced admins, there is often a space for negotiation. The price and other issues are solved flexibly. Sometimes you are even asked what price you would find reasonable. In such cases our offers were as follows: $5 for a shoutout in a community with 30-50K of subscribers; $10-15 for 50-100K; $20-25 for 100-250K; $25-50 for 250K and more. $50 was our maximum budget. You can also stick to these prices in case you are asked to set the price yourself. Some admins can temporarily (until the shoutout is over) place a link to your product page in their bios. Some take additional sum of around $5 for the favor; others do it for free, as a bonus. 2. The caption text with a call-to-action; 3. The link to the product page. It’s better to use Google URL Shortener if the links are too long; 4. The hashtags (some admins also offer their variants). We answered all comments in both accounts. If somebody asked questions about the product, we answered them publicly and privately (via Direct mail) and explained where the product was available for purchase. Sometimes we offered related products from our webstore. And then came the time for conversions! 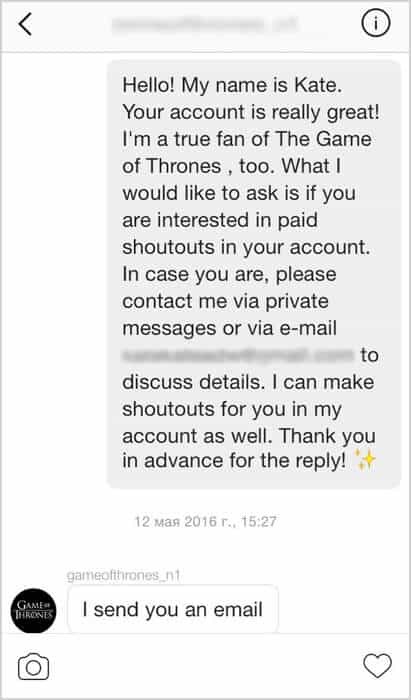 Instagram is not so convenient when it comes to backlinks, but links in bios and in direct messages do work, as you can see. The webstore’s traffic made up 1,000-2,000 sessions per month. Orders were not long in coming. 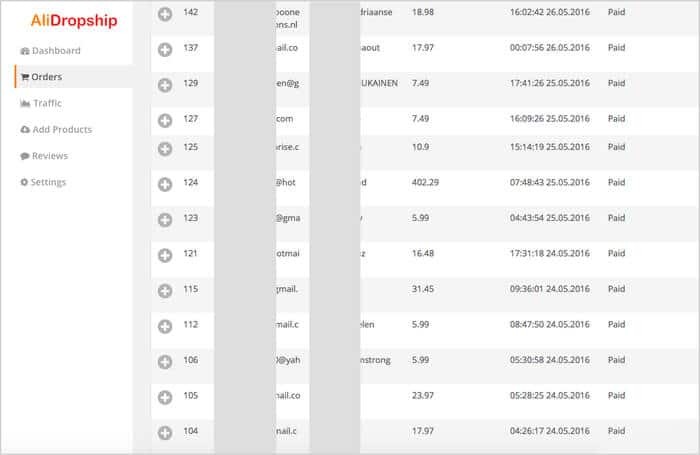 Just look at the number of paid orders in the website’s dashboard – and this is for just 3 days! In the first three months of Instagram shoutouts, we upgraded from 3 orders and $155 in March to 195 orders and $2,427 in May. The average monthly income comprises $4,500 at the moment. 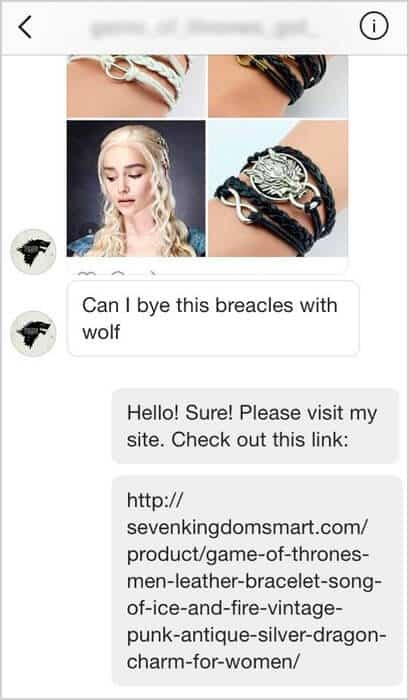 Promotion of your activities in the field of dropshipping on Instagram is quite simple and immensely effective for a fan merchandise webstore. Taking into account the huge popularity of Instagram and its focus on visual content, every store of this kind will find its receptive audience here.